We are sorry to report on the passing of our dear friend and Auxiliary legend, Betty Jane Eshbach. She was a dedicated Auxiliary member and worked tirelessly at the Post. She will be sorely missed. Betty Jane Eshbach, 96, of Millersville, passed away at her home on Tuesday, September 18, 2018, surrounded by her family. Born in Conestoga, she was a daughter of the late Milton and Lillie (Bickel) Bonham. Betty was the beloved wife of the late Lewis H. Eshbach, with whom she shared 64 years of marriage at the time of his passing in July, 2006. Betty was a 1940 graduate of Penn Manor High School. She worked as a bookkeeper for the former Millersville Supply Company. She later enjoyed her position as a Crossing Guard for the Penn Manor School District. 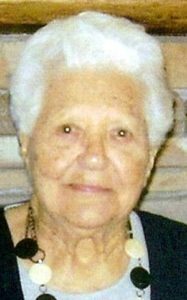 Betty was a member of the Millersville VFW Post 7294 where she was active with the Ladies Auxiliary for more than 60 years. A loving mother, grandmother and great-grandmother, Betty is survived by her son Christian B. Eshbach and his wife Cindy of Holtwood; four grandchildren, Christine Comp and her husband Danny of Millersville, Carolyn Oswald and her husband Travis of Mount Joy, Curt Eshbach of Millersville, and Cale Eshbach of Holtwood; and two great-grandchildren, Kylee and Daniel Comp. In addition to her parents and husband, Betty was predeceased by her son, Lewis John Eshbach, and two sisters, Emma Frey and Edna Deaner. Family and friends are invited to attend a funeral service which will begin at 2:00 PM on Wednesday, September 26, 2018, at the Charles F. Snyder, Jr. Funeral Home & Crematory, Inc., 441 North George Street, Millersville, PA 17551, where a viewing will be held from 1:00 – 2:00 PM. Interment will follow at Millersville Mennonite Cemetery. In lieu of flowers, contributions in Betty’s memory may be made to Hospice & Community Care, PO Box 4125, Lancaster, PA 17604. Condolences may be left at the Snyder Funeral Home webpage. NO STEAK SPECIAL THIS WEEKEND!!! Due to vacations steak weekend this weekend will be canceled. We do not have a cook available for Friday and Saturday . We apologize for any inconvenience and that starting on Wednesday we will be getting things back to where they used to be.